This sculpture is considered the warmest and most touching in our country. The composition is represented by one actor – this is a grandmother sitting on a bench. Made a composition of bronze, its weight is equal to three hundred kilograms. The opening ceremony was held in Belgorod on August 4, 2005, before the celebration of the city’s day. The composition was located in the park in front of the Drama Theater. Granny from bronze is kind and calm. She sits on a bench, knits a stocking and thinks of something good. So the granny sits among numerous fountains and does not notice that the sock has long been turned into a long stocking. If you look closely, then in her hands can not see the spokes. This is most likely done for general security. The composition was created by budding artists from Kharkov Taras Kostenko and Dmitry Ivanchenko. They just graduated from the Academy of Design and Arts. Officially, they called their work “Remembrance”. The authors themselves believe that this sculpture personifies time, its transience. Therefore, it turned out such a long sock. Bronze grandmother looks like a real, even visible mating on the stocking. On the floor are yarn, wound into balls, it is immediately evident. After installing the monument, people began to come here often. 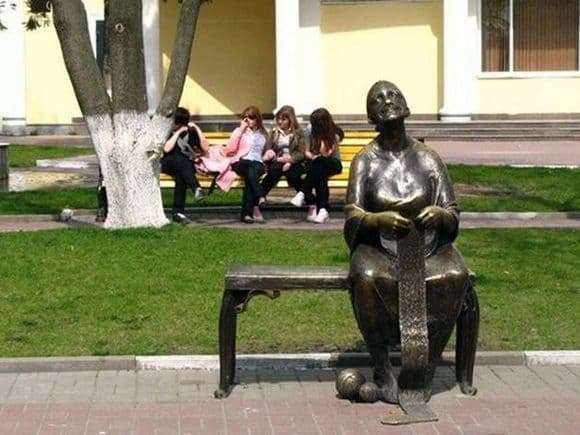 Grandma’s sculpture became popular in the city. On weekends and in the evenings you can see the people sitting next to her. They take pictures, some even talk to a granny, telling her about their joys and sorrows. Therefore, the place on the bench always shines as polished. Even young people like to make photo shoots with their grandmother. This monument in the city became a hit, sculptors successfully chose such a composition. After all, every person has a grandmother, and good and warm memories are always associated with her.